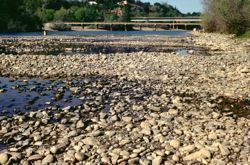 Lake Oroville California's ongoing drought has led to low river discharge and unfilled reservoirs throughout the state.. © California Dept. of Water Resources. Rivers Course Grad students in W&M’s School of Marine Science at VIMS had a chance to observe California’s drought first-hand during a recent tour of the state’s waterways. The students are part of Milliman & Canuel’s “Rivers” course at VIMS. From L: Professors John Milliman and Chris Hein; grad students Zhengui Wang, Erika Schmitt, Kelsey Fall, and Danielle Tarpley; Professor Elizabeth Canuel; and grad student Amanda Knobloch. Not pictured are grad students Andy Fallon and Eric Miller. Photo by David Malmquist. Drought & Discharge Daily discharge of the San Joaquin River (red) during the last two years (Oct 10, 2012 to March 14, 2014) is far below the long-term daily mean (blue). Recent rains have had little affect. © J. Milliman/VIMS. California Drought Between February 2013 and January 2014, California had the driest February-January period on record. Image courtesy of National Climatic Data Center/NESDIS/NOAA. Clifton Court Forebay The California Delta is one of the world's most highly managed estuarine ecosystems. Clifton Court Forebay is an intake source of water for the California Aqueduct. © California Dept. of Water Resources. Professor John Milliman of the Virginia Institute of Marine Science has studied a lot of rivers during his nearly 50-year research career. Lately he doesn’t like what he sees. Milliman—who has compiled the world’s largest river database with records from 1,534 rivers around the globe—is troubled by the confluence of a growing human population, increased water use, and decreased river flow. He sees the pattern worldwide, with his attention most recently focused on the drought-parched American West. California, now in the second year of a severe drought along with other western states, is struggling to allocate its increasingly limited water resources among a bevy of competing users, including farmers, homeowners, industry, and wildlife. The state just had its driest November to January period on record, and a statewide average of only 6 inches of rain for all of 2013, half the long-term norm. A recent storm helped "green the place up a bit," says Milliman, but "the reservoirs are still shockingly depleted." Helping California to resolve its water woes are VIMS professors Elizabeth Canuel and Rob Latour, who have been invited as out-of-state experts to advise policymakers and resource managers as they struggle to maintain a healthy ecosystem in the Sacramento-San Joaquin River Delta while much of its water is diverted to the cities of Southern California. Canuel is a member of the Delta Stewardship Council’s Independent Science Board, while Latour advises the Council and the State Water Resources Control Board. In addition to their scientific expertise, the selection of Canuel and Latour reflects a desire to ensure independent advice regarding an issue with huge economic, social, and environmental consequences. The Delta’s water is crucial to California’s $45 billion dollar agriculture industry, serves as a main source of drinking water for Southern California’s 25 million residents, and historically supported a vibrant wetland that—although now largely converted to farmland and channeled waterways—still draws hunters and anglers. California’s current drought has made the always-contentious task of distributing the state’s water even more difficult, says Milliman, because it’s affecting not only the typically arid southern regions of the state, but the historically wetter northern regions as well. 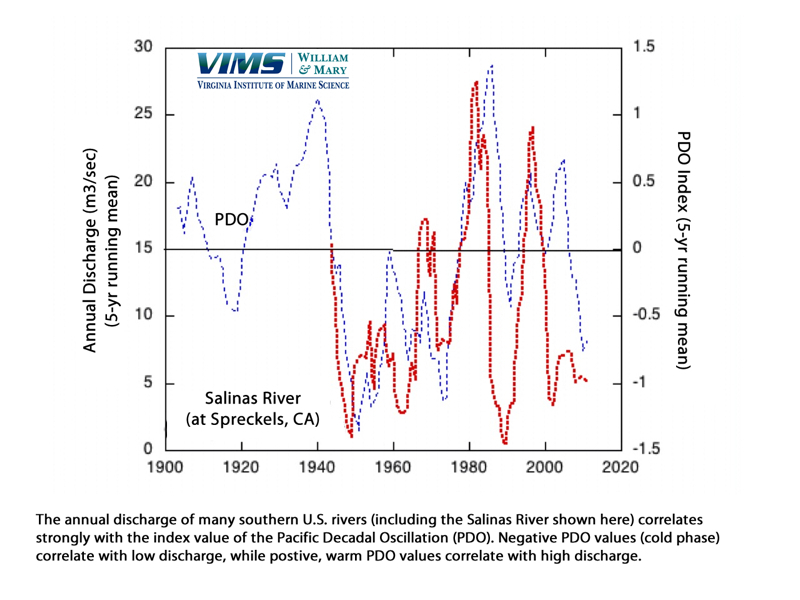 Based on his discovery of a strong correlation between precipitation in the western U.S. and the “Pacific Decadal Oscillation”—a 40-year fluctuation in ocean heat—Milliman also cautions that the current drought is likely to last for 10 to 15 more years. 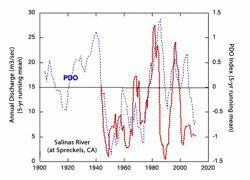 Towards the end of the last cold, rain-squelching episode of the PDO, in 1977, California’s population was 23 million people. It now stands at 38 million. That makes Canuel and Latour’s task—helping state agencies provide a reliable water supply while also protecting and restoring the Delta ecosystem—even more daunting. Latour, a fisheries scientist who directs the Multispecies Fisheries Research Program at VIMS, was tapped by California’s State Water Resources Control Board and Delta Stewardship Council for his expertise regarding the population dynamics of striped bass, shad, smelt, and other estuarine fishes that call the Delta home. Latour’s service began in spring 2012, when the Board invited him to help review and update the Bay Delta Conservation Plan. Most recently, he was invited in early February to assist the Council by advising an independent panel of experts on how outflow from the Delta might impact fish populations. Latour has studied this issue exhaustively by comparing data from California’s Department of Water Resources and its Division of Fish and Wildlife. For his part, Milliman sees reduced consumption as the most viable long-term approach for dealing with water scarcity. He cites examples from around the world—particularly China, the Middle East, North Africa, Southeast Asia, and North America—where dam-building, groundwater withdrawal, “inter-basin transfer,” desalinization, and other supply-side approaches to water management have provided short-term solutions but with long-term social, economic, and environmental costs.